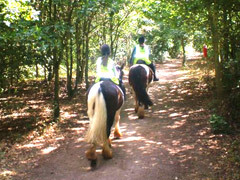 North Warwickshire offers the opportunity to go pony and horse trekking through a variety of country scenery-woodland, waterscape and open vistas across a landscape typical of the once Forest of Arden, much beloved of William Shakespeare. 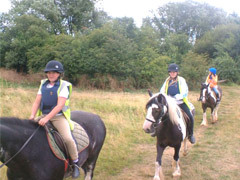 Dunton Stables provide both the pony trekking novice and experienced rider with the chance to enjoy permissive bridleways free from cars around one of the countries major visitor attractions. If you would like to try something different in horse & pony riding, why not try Dunton Stables on a summer evening or for a leisurely lunch. 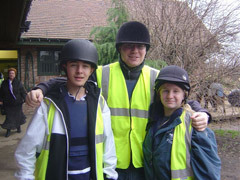 The trek is to a local canal side pub, The Dog and Doublet, and the pony trekking can be enjoyed by riders of all abilities. Please note that pub does not include trotting and cantering and is therefore suitable for absolute beginners too. 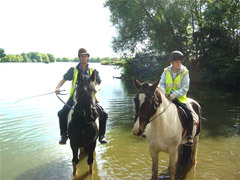 Kingsbury Water Park, which has recently revealed greater tourist numbers, still gives the ponmy trekking rider an 'away from it all' feeling as he or she goes alongside the River Tame, a name linguistically meaning 'dark water' that flows for 30 miles in Staffordshire and Warwickshire. The former gravel workings have now matured into a green landscape with a series of pools surrounded by a variety of trees and other vegetation. Part of the area, Hemingford gave its 12th century name to the wider Coleshill Hundred which was an old administrative sub-division of Warwickshire in medieval times. 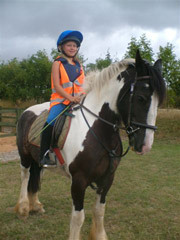 All areas covered are ideal pony and horse trekking locations.